While The Hobbit Trilogy was certainly a financial success for director Peter Jackson and Warner Bros., a majority of movie-goers had at least some problem with the Lord of the Rings prequels. The movies were certainly fun and full of incredible visual effects, yet they never truly lived up to par with the original Middle Earth trilogy. The prequel series followed hobbit Bilbo Baggins as he went on a quest alongside the wizard Gandalf the Grey and twelve dwarves as they sought to retake an old dwarven mountain, and the treasure inside. The issue was that these three movies were based on a single book, whereas the original Lord of the Rings trilogy was based on five larger books. There was not nearly enough content in these movies to merit a trilogy, and audiences were frankly disappointed. It turns out that the members of the audience were not the only ones who had a problem with The Hobbit. Actor John Callen, who played the dwarf Oin in all three Hobbit movies, stepped forward recently in an interview with YouTuber Lindsay Ellis. Callen revealed that his experience on the sets of The Hobbit trilogy was not always the most pleasant. "Even though we were in the core cast, we really did feel at some point that we were actually becoming the world's highest paid extras. Whether it had to do with the fact that the studios had said, 'Actually they're all right, these dwarves, yes, but the real stories are the battle between Thorin and the evil orcs, it's the story of the relationship between Radagast and Gandalf and finding Galadriel again and getting her help.' If that is what the studios were pushing for, then they certainly got what they wanted. What I think they missed out on was the heart that we started with." This is a legitimately fair complaint that likely was inspired by the changes Peter Jackson and Warner Bros. made when adapting the book to screen. The entire book included almost nothing except for Bilbo and the dwarves during their journey. In the book, every dwarf received the spotlight at some point, which is part of what made it such a heartwarming story. In order to flesh out the movies to make them into a full trilogy, Jackson wrote in a number of story arcs following Gandalf and a number of magical characters that were never in the book. While Gandalf did play a large role in the classic Hobbit story, at the point when Gandalf abandoned the dwarves outside the forest, we didn't see him again until they reached the mountain. Gandalf's entire story arc featuring the rebirth of Sauron and his run-ins with Radagast were made up completely for the movie. By the time the movie trilogy reached The Battle of The Five Armies, the focus was more on Gandalf and Sauron's armies than the dwarves themselves. In fact, the main villain of the movies Azog the Defiler, who was a servant of Sauron, was never in the book. He was briefly mentioned in Thorin's origin, but that was the extent of his run. His entire, complex arc in the movies was pure fluff that distracted the movies from their intended focus. When John Callen and the other dwarf actors first signed on for The Hobbit, they were likely very excited to be part of the journey. The characters in the book were heartwarming and lovable, and this certainly came off well in An Unexpected Journey. However, as Callen told Lindsay Ellis on Youtube, it didn't last. 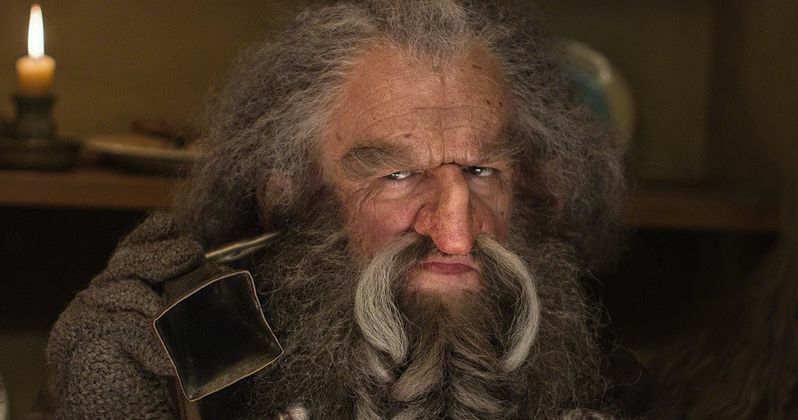 As the studio's priorities changed, so did the importance of Oin and the rest of the dwarves, making the on-set experience for The Hobbit trilogy truly miserable for a number of the actors involved.